On the first page of J. R. R. Tolkien's The Hobbit , we delight to discover that Bilbo's lovely hobbit hole is blessed with "pantries (lots of those)." The reader's curiosity is instantly aroused. What, pray tell, does the homely hobbit have hidden in his larders? Tolkien was rather scanty in his answer. Although he explains that for hobbits, "growing food and eating it occupied most of their time," Tolkien does not often describe what exactly they loved to grow and eat. However, the occasional descriptions we're given help us piece together the hobbit diet, and consider how Tolkien's choice of foods reflect his concept of the ancient Middle-earth chronology. These descriptions can also provide insights into Tolkien's underlying theme of the hobbits as nostalgic English yeomen. One of the more thorough descriptions of hobbit food comes from chapter nine of The Fellowship of the Ring . Frodo and the hobbits arrive at the Prancing Pony and Barliman treats them to a menu of "hot soup, cold meats, a blackberry tart, new loaves, slabs of butter, and half a ripe cheese. Good plain food, as good as the Shire could grow." As this food is here compared favorably to the Shire, and the hobbits make no comment upon the menu but gobble it down immediately, "not hindered by unnecessary talk," we can gather that this meal is rather typical of hobbit fare. This meal contains foods that are filling, simple, and could have been grown or produced on a farm. What other foods do the hobbits grow? Just after Gandalf leaves Bag End, Frodo notes that "the Shire had seldom seen so fair a summer, or so rich an autumn; the trees were laden with apples, honey was dripping in the combs, and the corn was tall and full." Farmer Maggot has "a huge turnip-field" and Sam Gamgee likewise knows this crop as a gardener. Other edible roots grown in the Shire include carrots and onions. We also know that hobbits "had a passion for mushrooms, surpassing even the greediest likings of big people." The finest variety are wild mushrooms from the Shire's marsh area. Mushrooms are also another of Farmer Maggot's crops. When still a young hobbit, Frodo tried to steal them. As Bilbo leaves Rivendell and begins the arduous climb over the Misty Mountains, he recalls summer back in the Shire, when the Shirelings will be busy blackberrying. So the hobbits are also fond of blackberries. Perhaps the berries inside Barliman's tart have come from the Shire? In The Hobbit , Bilbo serves a selection of foods to Gandalf and the dwarves who turn up unexpectedly on his doorstep. Bilbo, upon hearing the doorbell and thinking it is Gandalf coming for tea, "put on the kettle, and put out another cup and saucer, and an extra cake or two." Upon entering, the dwarf Balin requests beer and seed-cake, which Bilbo dutifully supplies. Later, before even the last of the dwarves arrives, "a big jug of coffee had just been set on the hearth . . . and the dwarves were starting on a round of buttered scones." Bifor requests "raspberry jam and apple tart." Bofur inquires after some "mince-pies and cheese" and Bombur is keen on "pork pie and salad." Gandalf has the poor flummoxed hobbit put on a few eggs, and admonishes him to "just bring out the cold cuts and pickles!" Bilbo remarks that the dwarves seem "to know as much about the inside of my larders as I do myself." Gandalf—the main instigator of the adventure—spends much time among the hobbits, so he is probably very familiar with their diets and the contents of their larders. Already we have seen the hobbits enjoy a variety of fruits, vegetables, and other flora: apples, turnips, carrots, onions, mushrooms, corn, blackberries, and pickles. We know also that Sam is fond of potatoes, and they are the Gaffer's "delight." As the hobbits pick blackberries, they probably also pick other seasonal berries, for eating and for tarts and jams, such as the raspberry jam requested by Bifor. They collect honey and eggs. It seems the hobbits are also fond of—and probably make their own—cheese, butter, bread, and preserves. They've mastered the art of baking; seed-cakes, fruit tarts, scones, and pies are all favourite hobbit fare. All of the foods mentioned above could be—and likely are—grown, cultivated, collected, and baked in the Shire. There is no mention in either The Hobbit or The Lord of the Rings of any foods being imported by the Halflings. When Tolkien writes that "growing food and eating it occupied most of their time," he isn't in the least bit exaggerating. Growing and eating food is a source of great enjoyment among the hobbits, who love to entertain their friends and families and eat six meals a day if they can get them. When he starts out on his journey, Bilbo fondly remembers the Shire not by the food itself, but by the activities involved in preparing the food: "haymaking is going on and picnics. They will be harvesting and blackberrying." Hobbits enjoy a good vintage, though wine is prized and saved for special occasions. For the uninvited gathering in Bilbo's home, both Gandalf and Thorin expect to be served red wine. Bilbo has inherited his father's—Bungo Baggins's—store of Old Winyards, so this is presumably what he offers his guests. Old Winyards is a strong red vintage of the Southfarthing, where several vineyards are located. We also know from The Hobbit that Bilbo has several beer barrels in his cellar, and the hobbits drink "good deep mugs of beer" at the Prancing Pony. Beer is a popular drink among hobbits, and does not seem to be reserved for occasions. It is not clear, however, whether hobbits drink imported beer or local brew, though one suspects the latter. A pipe-smoker himself, Tolkien endowed the Shire with crops of "pipe-weed," grown for local consumption and export. Tea and coffee are also mentioned as being served by Bilbo. One wonders where the hobbits acquire tea and coffee. Do they import these goods, and if so, from where? Or do they grow the crops themselves? Both tea and coffee grow best in a warm climate with well-drained and sandy soil, so the Shire with its temperate maritime climate is not ideal. The Southfarthing would be the most likely area for tea and coffee production, either in Longbottom where the pipe-weed is grown, or in Green Hill Country. More probably, though, these are luxury goods imported from elsewhere in Middle-earth. From Saruman's storerooms in Isengard, Merry offers Gimli "first-rate salted pork" and "rashers of bacon." Martinez argues that this meat is probably Shire-raised, as Gondor is an unlikely trade partner for Saruman, and the pipe-weed in his storerooms also comes from the Shire. Assuming Martinez is correct in his assertion, we know that the hobbits raise and eat pig. We also know they're fond of fish, as demonstrated by Sam's offer to cook fish and chips for Gollum. Rabbit meat, or "coney," is another favourite, particularly in stew. As for sauces and seasonings, they are seldom mentioned. Hobbits do not favour rich sauces or dressings. When Sam boils the rabbit, he orders Gollum to find him some simple herbs; "a few bay-leaves, some thyme and sage, will do." Sam also carries a little salt-box with him, for seasoning. Herblore is important to hobbits, and herbs grow in the Shire, especially in the Gaffer's garden. But how does salt reach the Shire? Martinez believes it comes from the dwarves, who could buy it from the elven coastlands. Tolkien the historian must be at least vaguely aware of the antiquity of the foods he chooses to include in Middle-earth, and his decisions are purposeful. Humankind has baked bread for around 12,000 years, and studies suggest the Neanderthals might have invented soup. Tea has been drunk in China since the 6th century BC, around the time mushrooms became popular. The Persians have drunk coffee since the ninth century. Cheese and grapes have been consumed for around 6000 years. All of these foods are eaten by hobbits. It appears that Tolkien deliberately chose "ancient" foods that fitted with his idea of Middle-earth as a pre-English mythology. However, not all of his food choices fit neatly into the chronology. The mention of corn in the Shire is interesting, as it could be interpreted as a mistake. Evidence of maize production dates back some 20,000 years. However, maize was grown only in the Americas until very recent times, so chronologically it could not be growing in Middle-earth when Frodo walks past. But the word "corn" is ancient and can be used to describe many different crops. Treebeard, in his song to the Entiwives in The Two Towers , mentions "corn . . . in the blade," a line that evokes a grass cereal, such as wheat, before it grows an ear. More than likely, however, Tolkien has chosen a seemingly "antiquated" food and hasn't concerned himself with fitting this food accurately into his chronology. As for potatoes, Native Americans began to eat them around 2500 BC and this root was not introduced into the European diet till much later. Until the eighteenth century, Europeans believed that a person could catch leprosy from eating potatoes. Some writers contend that Tolkien's so-called potatoes represent a different plant or a crop that came east in the holds of the Númenóreans but later went extinct in Middle-earth. Again, their inclusion suggests Tolkien wasn't being meticulous about including only foods that fit his chronology. 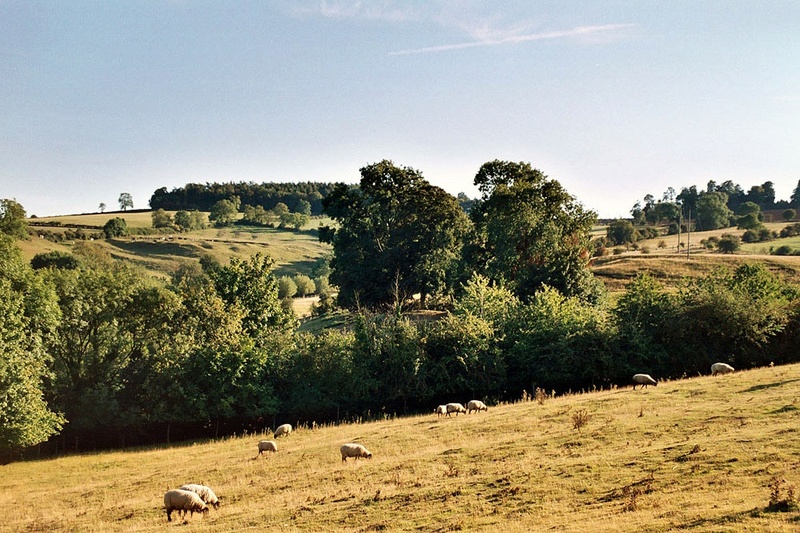 This farmland lies in Warwickshire, an area that inspired Tolkien's depiction of the Shire. Image © Norman Baltes. Used by permission. But for what reasons does Tolkien choose to include particular foods in the hobbits' diet if they do not belong there? Surely a man with as great an attention to detail wouldn't overlook this important data? Tolkien himself answers this question in his admission that the hobbits are a self-portrait of the rural English pastoral tradition. The inspiration for the Shire comes from rural England, particularly the region Tolkien considered his native land, the West Midlands. Hobbiton, Tolkien admits in a letter, "is more or less a Warwickshire village" of the late 1800s. The hobbits themselves serve as archetypes of the English yeomen with simple needs, simple goals, and simple fare. Curry points out that the hobbits "fall within the long tradition in English letters of nostalgic pastoralism." As such, the foods cultivated and eaten by the hobbits are all foods that would have been grown or raised in rural England prior to the industrial revolution. Many of the foods described are stereotypical English dishes: the fish and chips Sam offers to cook for Gollum, the buttered scones, putting the kettle on for a cup of tea, the mince and pork pies. As Tolkien tries to convey the image of hobbits as pre-industrial English pastoralists, he consequently imagines them eating foods that fortify this image. The pursuit of this image holds more creative sway for him than fitting the foods of the Shire and Middle-earth into his chronology. After all, what are fish 'n' chips without the "taters"? The only goods that the hobbits seem to import are tea, coffee, and salt. For an English yeoman tea and coffee were also imported luxury goods. Again we see Tolkien's desire to represent hobbits as English yeomen. Salt is interesting because Tolkien's use of salt is credible within his chronology. Roman Britain had a salt-panning industry, but, due to environmental changes, salt production decreased over the medieval period. So although sea salt is no longer an abundant product of the U.K., it would have been in the Second Age, and the hobbits could have imported it from the coast. The hobbit larder is certainly well-stocked. It contains several vegetables and fruits, preserves, meats, cakes and scones, pastries and pies, tea, coffee, beer, and occasionally wine. Their food is extraordinarily simple—heavy seasonings and rich sauces are seldom talked of, though they love herbs and a pinch of salt. Almost all hobbit food seems to have been grown, raised, collected, brewed, processed, and baked in the Shire, a feat which inspired great pride and perhaps even a little smugness amongst the hobbits. Not all of Tolkien's food choices fit directly into his chronology, but he does choose foods that feel antiquated. It seems his choice of foods is more influenced by his representation of hobbits as yeomen of the English pastoral tradition. Tolkien, J. R. R. 1995. The Hobbit . London: Harper Collins. Tolkien, J. R. R. 1981. The Letters of J. R. R. Tolkien . Boston: Houghton Mifflin. Tolkien, J. R. R. 1995. The Lord of the Rings . London: Harper Collins. Toussaint-Samat, M. 1992. A History of Food , translated by A. Bell. Cambridge: Blackwell. Curry, P. 2004. 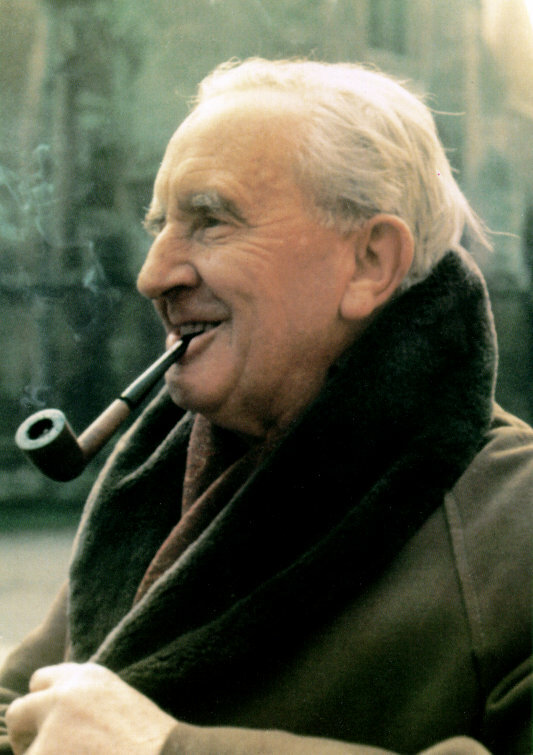 Defending Middle-earth: Tolkien, Myth and Modernity . Boston: Houghton Mifflin. Martinez, "Pasta la Feasta, Baby"
Stephanie Green lives in New Zealand with her cantankerous drummer husband and a cupboard full of swords. By day she transcribes braille and produces large-print and audio books for the blind, and by night you'll find her tearing up the mosh pit at her local heavy metal bar. This article was amazing. It helped me make a hobbit-like luncheon and tea-time snack, while being accurate to Lord of the Rings. [Again, their inclusion suggests Tolkien wasn't being meticulous about including only foods that fit his chronology.] Say rather that the big people have been slow to pick up some hobbbit skills.